The end does not seem near for the ongoing radar row between Seoul and Tokyo, as the two governments continue to clash after a recent general-level meeting. The radar row erupted last month when Japan claimed that South Korea’s naval warship had locked its weapons-targeting radar onto its warplane. 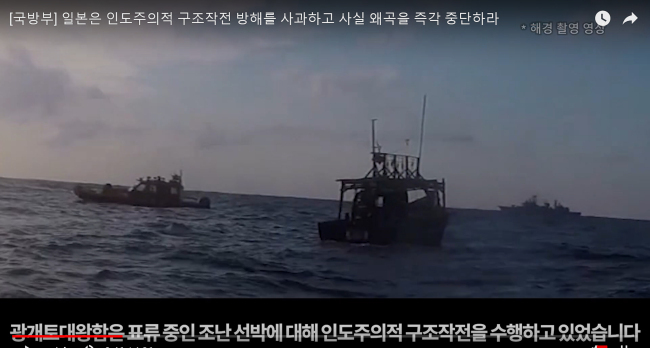 Korea has rejected the allegation and maintains it was on a humanitarian rescue mission of a North Korean fishing boat adrift in the overlapping exclusive economic zones of South Korea and Japan. The two sides held a general-level meeting in Singapore on Monday, but failed to narrow the differences, according to the Defense Ministry here. Ministry of National Defense said Thursday that it called in the military attache from the Japanese Embassy here to lodge a strong complaint against Japan’s claim and to request clarification. The move came a day after Tokyo called in the Korean Embassy officials in Japan to protest, saying that what Seoul’s Defense Ministry has said about the recent general-level meeting was incorrect. The Defense Ministry here had told reporters that, during the general-grade meeting, they had requested the frequency of the radar that Japan claims to have detected, so that the two sides could examine the data together. But Japan refused, and demanded the complete frequency information for the Korean Navy destroyer’s fire-control radar, according to the ministry. “We have clear-cut scientific evidence to corroborate our position that our STIR did not send out any signal,” a Defense Ministry official had told reporters. The ministry also called on Japan to apologize for having its aircraft fly low-altitude and posing a threat to its vessel. To that, the Japanese government reportedly rejected the allegation, again, to the Korean Embassy officials. On Thursday, Japan’s Self-Defense Forces Chief of Staff Katsutoshi Kawano also said that Japan has concrete evidence backing its claim against the Korean destroyer. While the ongoing clash shows no sign of abating, it has also triggered controversy on YouTube, with the defense ministries of the two countries explaining their positions on the online platform. Japan was the first to take the issue to YouTube, uploading a 13-minute clip of the incident taken by its patrol plane to its YouTube channel on Dec. 28 with subtitles in Japanese and English to reinforce its claims against Korea. After expressing regret over the video clip, Korea’s Defense Ministry also released videos in eight languages --Korean, English, Japanese, Chinese, French, Spanish, Russian and Arabian -- using Japan’s footage in early January. As of Thursday, all eight versions of the clips had recorded at least 50,000 views. The Korean version attracted 1.94 million views. Over 640,000 clicks were recorded for the English version and over 220,000 for Japanese. “On the first day when we released the Korean and English versions (on Jan. 4), the comments were filled with Japanese and it received thousands of ‘dislikes.’ The next day, Korean users came to counterbalance with ‘likes,’” a ministry official said. According to the ministry, more than half of the views for the clips in all of the eight languages have come from Japan.